German unemployment increased by 196,000 in January (not seasonally adjusted), bringing the total number of unemployed to 2.406 million; the highest level since March last year but still significantly lower than in January last year. In seasonally-adjusted terms, unemployment dropped by 2,000, leaving the seasonally-adjusted unemployment rate unchanged at 5.0%. The number of vacancies continued the recent trend of levelling off, dropping to 757,700. To put today's increase into perspective, it's still the second lowest January increase of the last 20 years. Trade conflicts, a Chinese slowdown, problems in the automotive industry and Brexit. While the combination of these factors brought the German economy close to a technical recession at the end of 2018, the labour market is still bursting with strength, with unemployment numbers at record lows and the number of vacancies and employment at record highs. Inflation is also low and nominal wages are higher. There is hardly any better insurance against recession fears. And there is more. Digging a bit deeper into recent labour market developments shows that the share of low-wage jobs in the labour market has dropped to the lowest level since 2004, some 23%. Also, while in 2004 only some 20% of the low-wage jobs were labelled as voluntary or part-time, this share has increased to more than 35%. This suggests that more “better-paid” jobs have been added to the economy, boding well for private consumption in the months ahead. Looking ahead, some might argue that the labour market is a lagging and not a leading indicator and that the full impact of the recent economic slowdown and increased uncertainties has still to come. Indeed, the labour market is a lagging indicator. However, the reforms of the 2000s, as well as the strengthening of the domestic economy, seem to have made the labour market more resistant to external shocks. Interestingly, as our chart suggests, it would need a much stronger cooling of the economy to see the labour market turn. This is also reflected in the recent European Commission economic sentiment indicators, showing decreasing but still positive recruitment plans in both the manufacturing and services sector. 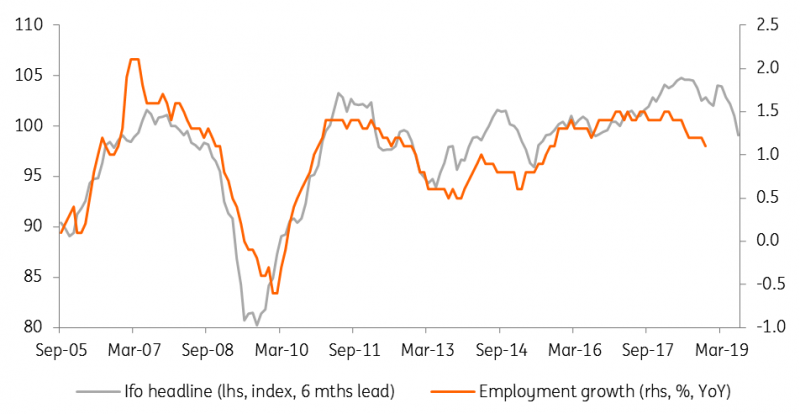 All in all, the German labour market remains an impressive engine for the entire economy, currently defying all external downside risks and uncertainties. At least for the time being, there is very little reason to see the last, rather stubborn, stronghold of the economy falling.